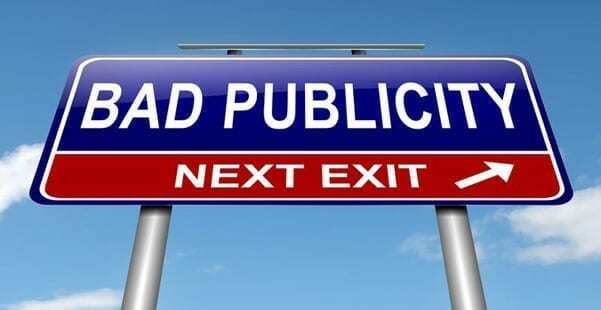 If you are one of the many PR agents or crisis communications companies who genuinely believe in the age old saying, “There is no such thing as bad publicity.” You may want to think again. The quote coined by Phineas T. Barnum, an American performer and circus owner, has turned into one of the biggest myths in the PR world today. Why? Because it’s just not true. Sure, there are examples showing bad publicity increasing brand impressions and overall sales – Kenneth Cole comes to mind – however, there are also examples where bad publicity has shown a negative impact on businesses and personal brands. Remember the BP Oil Spill? BP Oil spent millions trying to recover from that Deepwater Horizon disaster. Remember Tiger Woods? His scandal branded him as a serial cheater, tarnishing his god-like reputation, losing millions and numerous sponsors, including Accenture and AT&T. Let’s be honest: There’s more to reputation management than deleting inappropriate tweets or sending out apologies. While it’s nearly improbable for you to predict every possible PR crisis for every situation, it’s possible and in good practice to plan for the unexpected with a framework. Below we share quick and useful tips on how to handle a PR crisis. Great leaders have the common sense to remain calm during a crisis, so when disaster strikes, remember it’s important to keep your cool. Take a deep breath and understand that you make better decisions when you’re not in a panic. The last thing you want to do is fan the hysteria. We’ve seen brands lose their cool in the past and it does get ugly, making the PR crisis that much more difficult to manage. Sure, you may be the boss, but it’s highly likely that you may be unaware of all the details surrounding the PR crisis at hand. Before rushing and making a statement to the press, make sure you know all there is to know about the situation. Use online tools and leverage your resources to gather all the facts, intelligence, and subtleties. And again, remain calm and make sure you know the story before reporting a knee-jerk reaction. The last thing you want to do is commit to a statement and retract comments during crisis management. When this happens, you’ll instantly lose credibility, and it can do you more harm than good. Share your message with your reputation management and PR team and agree on a unified statement. Track down your marketing team, social media team, customer service, and other people in the front lines who have to communicate your message to the masses. Keep your message simple, clear, and unified. When you make your first statement, state how early you have responded to the crisis and how it’s too early to tell all the details. Be sure to lay out the information you have gathered and touch on the following talking points: Your sense of urgency; the officials you’ve contacted and currently working with; how stable the situation is and if it’s under control; advice for customers; what’s being done to ensure the issue doesn’t happen again; and a thank you to everyone for their help and cooperation. You’re never going to find out whether or not your PR crisis management strategy is working until you measure it for success. Make sure to listen and track your strategy. Eavesdrop on conversations and use social media management tools like Meltwater. You can also track trending conversations on Google Trends or Facebook, measure hashtag impressions, and the number of times people mention you on Google via Google Alerts. Be sure to read comments and dive into the public discourse to gauge the damage. Does the public side with you? If not, you may need to adjust your reputation management strategy and do your best to control the conversation. Maintaining a level of transparency with your target audience is crucial when earning their trust. Many brands in the past had deleted negative comments, ignored posts, and even claimed their accounts were hijacked by hackers when they clearly weren’t. In today’s fast-paced digital world, users are also hyper content creators. Memes spread like wildfire, and if you make the wrong mistake, you potentially set yourself up for a viral PR disaster. Be transparent about what you do or what has happened. If you made a mistake, address it as an isolated issue and identify how much you value your customers. Show them what you are currently planning to do to prevent any issue like this from ever happening again and who you’re working with at the moment to improve the situation. After crafting a simple and clear unified statement, it’s time to spread your message to the masses. Pick your desired distribution channels, whether it be on traditional TV, a press release, social media, blog, and other channels, you’ll want to make sure your voice is heard, and you reach your target demographic. Find your relevant media watering holes and market your message. It’s obvious that businesses and brands want to prevent PR crises from ever happening. But, now and then, when they do occur, Rep Management and PR teams are left with headaches and stories about what they did and what they could have done. Despite it being a highly stressful time, a PR crisis is also an opportunity to learn. Be sure to note both strengths and weaknesses of how the crisis was managed. Discover valuable insights and create a list of improvements that you can take with you to help improve your reputation management strategy moving forward into the future. Remember the tried and true Benjamin Franklin quote, “By failing to prepare, you are preparing to fail.” When you’re managing a reputation online and crisis strikes, you want to fall back on a framework. Remember to keep calm, know the facts and nuances, provide a clear and unified message, listen and monitor conversations, maintain transparency and spread your message across all relevant channels, and learn from all your ‘wins’ and ‘losses.’ At the end of the day, you’re going to have to look back and answer whether you fanned the flames or managed to put the fire out. Next Post | SEO Image Recognized as A Top NYC SEO Firm!